Business Plan Competition Finalists. 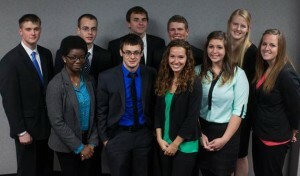 Back row (L to R): Ryan Ramey, Joseph Risinger, Jordan Wodetzki, Mike Reitz, Dana Johnston, Carmen Barnhill. Front row (L to R): Joy Itiola, Mike Depositar, Jalisa Thayer, Katie VanSloten. Proposals for an alternative apparel business, a lawn care service, and an automobile showroom took top honors in the 2013 Business Plan Competition at the Grace College School of Business recently. Winners received cash prizes to help execute their plans. Joy Itiola received the first place award of $5,000 for Eulalie, an alternative apparel brand. The second place prize of $2,500 was awarded to Joseph Risinger for his Green Stripe Lawn Care business plan. Third place (a $1,000 prize) was awarded to Ryan Ramey with his plan for Showroom Auto. The competition was held Wednesday, April 24, at the Orthopaedic Capital Center on the Grace College’s campus in Winona Lake, Ind. Six teams of business students participated in the final round of the contest. Each team was given five minutes to present their business plan to a panel of judges and ten minutes to answer their questions. The event was hosted by the Grace College School of Business and the Gordon Institute for Enterprise Development and sponsored by Silveus Insurance Group, Redwood Information Technology and Wildman Business Group. The competition offered students in the School of Business the opportunity to create a viable business plan and compete for funds to help create that business. Students were given about four months to research and write detailed plans for their proposed business ideas. During the process, students met with members of SCORE, volunteer business consultants from Elkhart and Fort Wayne, to receive direction and advice. The first round of the competition consisted of judges analyzing the written copies of each plan and choosing finalists out of the original 15 teams. Other finalists in the competition included Kairos Studio & Café, created by Carmen Barnhill and Jalisa Thayer; IRE Industries, created by Michael Depositar, Dana Johnston, and Katie VanSloten; and SIPS, created by Michael Reitz and Jordan Wodetzki. The panel of judges included Caleb France, owner of Cerulean Restaurants; Kim Snow, owner of Prosperity Institute in Arizona; Terry Schlotterback, owner of TDS Orthopaedic Consulting and Stepstone Angels; George Robertson, president of Kosciusko Economic Development Corporation; John Becker, president of Advocate Financial; Mark Dobson, president of the Kosciusko/Warsaw Chamber of Commerce; and Jeff Cahill, entrepreneur .